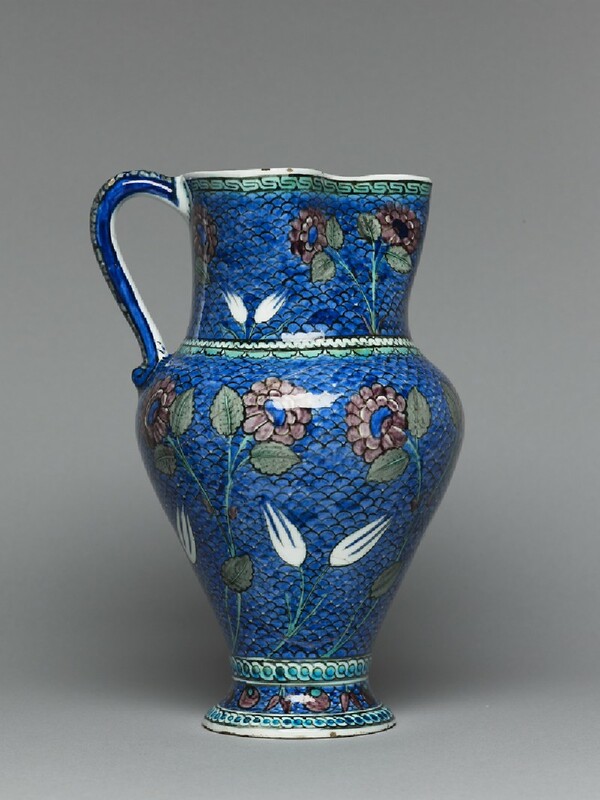 In the early 16th century, the potters of Iznik developed one of the most beautiful ceramics ever made. They created vessels and tiles out of a pure white body, which provided a glowing ground to a lively range of colours. Blue and turquoise were the first colours used, and later the characteristic Iznik palette – in use since the mid-16th century – included a bold red and emerald green. 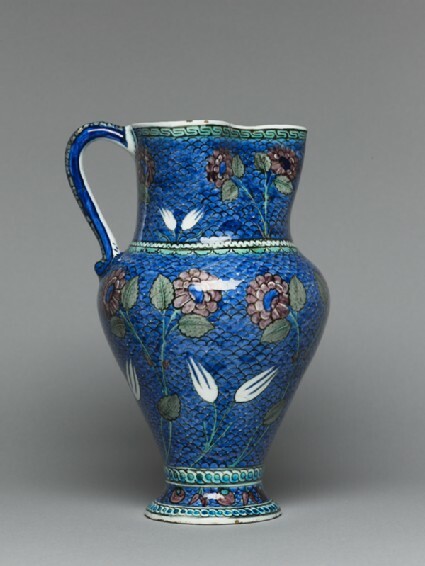 This jug, on the other hand, exemplifies the subtle and harmonious palette of the middle period. Purples, soft sage-green and deep blue, each outlined in a sharp black, were in use from the 1530s to the 1560. The sprays of tulips and roses against a blue ground, demonstrates the richness of this colour scheme. The representation of plants in this example is still rather simplified - a more naturalistic approach would coincide with the introduction of the later palette. Flowers were as popular among the Ottomans as they are in England today. In 1554, for example, the Holy Roman Emperor’s Ambassador to the Ottomans records how visiting Janissaries would offer him a bunch of hyacinths or narcissi. (In fact it was this same Ambassador, Augier Ghislain de Busbecq, who introduced tulips into Europe). The appearance of recognisable species of flowers on Iznik ceramics was due to the rise to eminence of one particular artist, Kara Memi, at the court of Suleyman the Magnificent. Kara Memi transformed Ottoman illumination by introducing naturalistic flowers, such as tulips, roses, hyacinths and carnations, to replace the traditional, stylised, Islamic floral motifs and arabesques. Although some traditional elements were still retained, like the peony in this dish [EAX.3277], the naturalistic flower designs clearly captured the imagination of the Iznik potters. First making their appearance in the 1540’s, they were accompanied by a new colour scheme. To the blue and turquoise of the preceding decade were added a soft sage-green, a manganese-purple, and a soft greenish-black for outlines. Experiments were made with colouring the background, and a fish-scale pattern introduced to help alleviate the monotony of a large area of single colour. The final phase (nos. 46-47 [EAX.3268 & WA1888.CDEF.C324]) was the introduction of a new, vibrant colour - ‘sealing-wax’ red.